Brent Heaver was a right footed forward pocket / midfielder who played 64 games for Carlton in between 1992 and 1996. An opportunistic forward pocket with a flair for a goal on the run or a clever snap, Heaver wore the #17. Heaver was originally from Melbourne, but Carlton recruited him from Epping. After a couple of seasons and 12 games / 12 goals with the 'Dees - including 5 in a game against the Blues in his league debut (in Round 11, 1990), he was delisted and picked up by the Blues in the 1992 Mid Season Draft. Heaver played a significant role in our unsuccessful tilt at the 1993 Premiership with 48 goals from 23 games, a phenomenal output for a true pocket. At 173 centimetres and 73 kilos, Heaver was small but nimble. Despite his success in this year, Wanganeen of the Bombers would appear to have the edge over Heaver and "Heavs" would only kick 1 in the '93 Grand Final. Heaver played 15 games in 1994 for 24 goals, and only 5 in our 1995 Premiership year, with his last coming in Round 21. 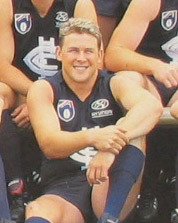 Despite 19 games in 1996, Heaver was traded to the incoming Port Adelaide Power in return for the untried South Australians Andrew Balkwill and Ben Nelson. Heaver would play 2 seasons for the Power before retiring at the end of 1998. In total, his league career game total at his three clubs were 84 games and 127 goals between 1990 and 1998. Heaver would later try his hand at coaching, he was in charge of DVFL club Greensborough in 2001 and 2002. Articles: Despised to Blue: Players recruited for killing the Blues! Contributors to this page: Bombasheldon , molsey , WillowBlue , true_blue24 , Jarusa , steve and admin . Page last modified on Sunday 02 of June, 2013 08:40:31 AEST by Bombasheldon. 1987 - Ex Blues & now Saints; McConville, Kourkoumelis, Marcou, Jones, Sheldon & Nixon (10/04/87). Maclure and Percy celebrate a goal.